Have you gotten out of the habit of sending snail mail and stress out about the simple act of addressing an envelope? That's what happens when you haven't done it in a while, but don't let it stop you from putting a pen to paper and mailing something that requires a stamp. It's important to put the intended recipient's and sender's addresses in the correct spots on the envelope. Double check the recipient's address to make sure you have the correct one. Whether you're doing business through the postal service or mailing someone a love letter, you need to know the proper way to address the envelope. Sometimes you're required to send hardcopy business correspondence through the mail. 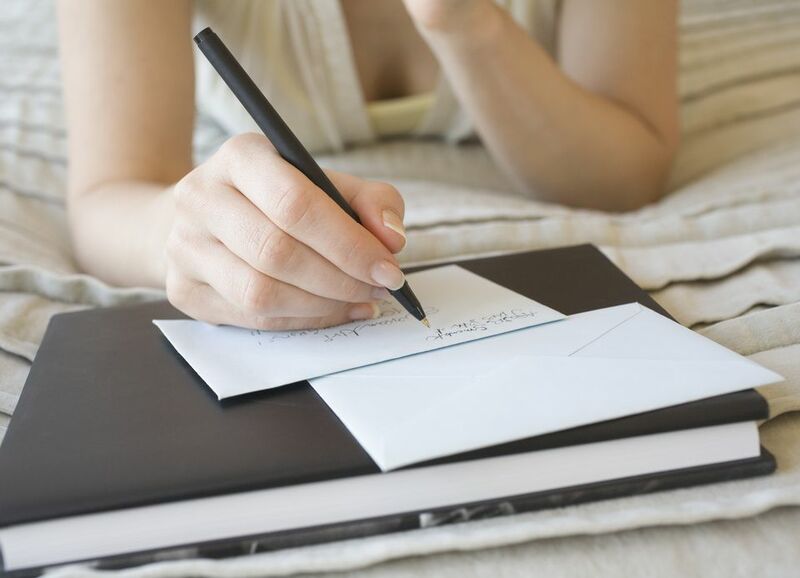 While sending messages and thank you notes via email has become acceptable, even better etiquette is to send a handwritten note. In some cases, it's fine to send email, but there are occasions when you'll want to use an old fashioned method of correspondence. Whether you're mailing an invitation, thank you note, or a letter, you'll need to include some basic information on the envelope to ensure that it reaches its destination in a timely manner. Addressing an envelope isn't difficult if you understand some of the basics. The USPS needs to know the destination as well as where the piece of mail is coming from in case there's a problem with the delivery and it has to be returned. The purpose of having guidelines for addressing the envelope is to make the postal workers' jobs easier in sorting and delivering the mail. If you get too creative, you'll slow the carrier down and may even risk having your letter go to the wrong address. Please save your creativity for what is inside for the sake of the USPS. Also make sure you write clearly to make the address easy to read. Using cursive or an italics font can put a strain on the carrier's eyes. Most of the time you can fall back on the general recommended rules of addressing your envelope, whether you are sending a business letter or a thank you note. In the upper left-hand corner, you'll need the sender's name on the top line, the street address or post office box on the second line, and the city, state and zip on the third line. In the center of the envelope, you should put the name of the intended recipient on the top line, his or her street address on the next line, and the city, state and zip on the third line – exactly how you would write the sender's information. However, you may need an additional line for the name of the company or unit of the address such as an apartment or suite number. You'll want to add any titles such as "Dr." or "Ms." if you know that the recipient prefers to be addressed as such. You should also do this when sending to an elderly person or someone in a position of authority to show respect. In some cases, such as when a woman lives alone, people prefer not to have their full first names on the outside of an envelope. You may use an initial, such as "M. Peabody." This makes the name less gender specific and may give the person a more secure feeling of anonymity. If the recipient is temporarily staying in someone else's home or you are concerned that the USPS may not deliver the mail with an unfamiliar name, you may add a note beneath the recipient's name that this is in care of someone who lives at this address. For example, you may use "C/O John Smith" on the line beneath "Mildred Thomas." When sending a business letter, you'll need to maintain professional etiquette throughout the entire process. Start with the general guidelines and add a couple more pieces of information. After the recipient's name, add his or her position, such as "Director of Marketing." Try to do this on the same line as the name, but if there isn't enough room, you may move the title down to the next line. Beneath that, add the name of the company, followed by the address as directed in the general guidelines above. If you're unsure of the recipient's name, you may write "Attn: Director of Marketing." When you send a letter to a person in the military stationed overseas, use the same general guidelines with a few additions. You'll want to add the recipient's rank and full name. The unit or squadron number should go on the second line. The next line should include APO or FPO, according to where the person is stationed, followed by the abbreviation of the region. The last line should include the name or abbreviation of the country in caps. Always add the full postal code to make sure it reaches the intended destination. The general rules for addressing an envelope for European or other overseas destinations are similar. Start with the recipient's name and title on the first line, followed by the street address on the second, the city, province, and state with the postal code on the next line. The last line should have the name of the country in all caps. Beneath your return address, you should include "U.S.A."